70년대 이후 산업화가 급속도로 진행되면서 국가의 경제성장은 높아진 반면, 그 과정 속에서 우리 삶의 터전은 콘크리트 풍경으로 변해버렸다. 어릴 적 산과 들로 둘러싸여 자연의 아름다움을 간직했던 작은 마을은 이제 온통 차갑고 딱딱한 콘크리트에 의해 지배되어 버렸다. 나의 작업에는 어린 시절 막힌 데 없이 한적한 시골마을 풍경을 바라보는 시각과 재개발로 인해 콘크리트 구조물로 쌓여진 아파트 숲을 바라보는 시각이 공존하고 있다. 무분별한 도시화로 인해 소외되고 잊혀지고 사라지는 우리의 고향에 대한 이야기를 하고자 한다. 시간의 흐름에 따라 새로운 도시가 형성되고 쇠퇴하듯이 그곳에 살던 사람들의 존재 또한 생성과 소멸의 과정을 반복한다. 낯익은 장소지만 낯선 사람풍경으로 변해가는 모습에 불안감, 소외감 등 심리적인 갈등을 경험하면서 상실한 대상을 되찾기 위해 나는 과거의 시간으로 이동한다. 흐르고 중첩되는 수많은 붓질을 통해 나의 고향은 뿌옇게 흐려진 기억의 흔적들과 가상의 풍경들이 재구성되어 상상의 공간으로 재현된다. 나는 오늘도 온기 없는 도시공간의 딱딱한 보도블록을 걸으며, 풍요롭고 편리한 현대사회의 이면에 숨겨진 인간성 상실과 소외된 삶의 문제에 대해 생각해본다. 전시를 통해 소음과 공해로 뒤덮인 현대의 도시에서 잠시 벗어나 무의식 속에 잠재되어 있던 어린 시절의 불확실한 이미지 퍼즐을 맞춰보며, 가상의 기억을 만드는 행복한 시간이 되길 바란다. Since the 1970s, Korea has gone through rapid industrialization and impressive economic growth, while our living environment has become surrounded by concretes. In my childhood, this village was surrounded by mountains and the beauty of nature. Now, it is being dominated by cold and hard concretes. I intend to tell a story about our neighborhood that is being ignored and disappeared by reckless urbanization. My painting works contain the two dierent perspectives I have towards a quite landscape of the countryside where I grew up and a forest of apartment buildings with concretes that were built by the city’s redevelopment. As time goes by, a new city emerges and declines. The same holds true for people living there. I feel left out and have an anxiety about the familiar place yet lled with unfamiliar people. I move back to the past to retrieve lost things. I make owing and duplicated brush strokes to reconstruct and reproduce my past with my dim memories and imaginary landscapes. I walk on the ‘not-warm’ pavement blocks in the city and think about the loss of humanity and isolated lives hidden behind a convenient and prosperous modern society. I hope that this exhibition will make you steer clear of the city filled with air and noise pollutions for a while, and have a pleasant moment of putting the pieces of a puzzle of your childhood embedded in your subconscious and making your own imaginary memories. #2 Experience Zone : "Remember a Memory"
어린 시절 즐거웠던 추억의 장소 '놀이터'를 그려주세요. 점선을 따라 완성하거나 나만의 놀이터를 창의적으로 그려도 좋습니다. 선착순 50명에게는 현미 작가가 그림을 완성하여 선물로 보내드립니다. 현미 작가는 현재 대구대학교 현대미술과 석사과정 중이며, 최근 '화기애애'(롯데갤러리, 대구), '옥수수'玉秀手展(구올담 갤러리, 인천) 등 그룹전 및 2016년 ASYAAF(아시아 대학생·청년작가 미술축제) 참여작가로 활발하게 작업활동을 하고 있다. 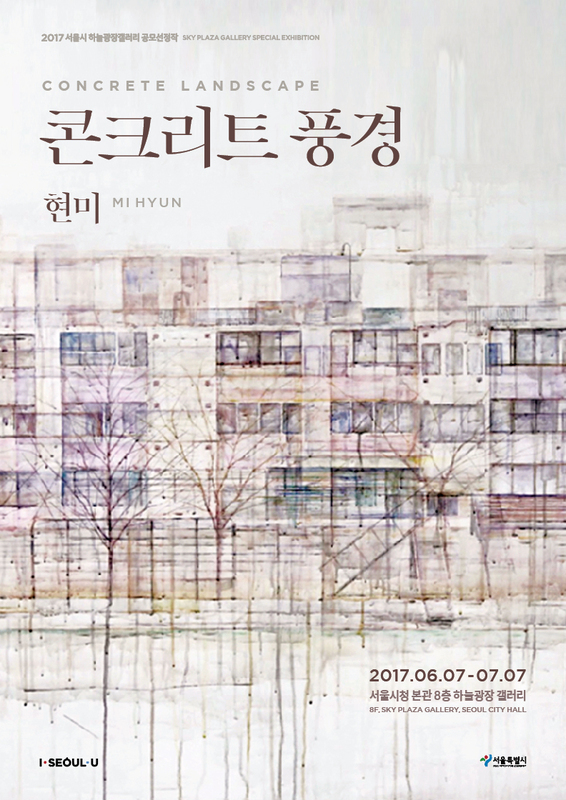 Hyun Mi is currently studying at the Graduate School of Contemporary Art of Daegu University. She recently participated in the Young Artist Project ‘Hwagiaeae’ held at Lotte Gallery in Daegu and the ‘Oksusu’ Exhibition (玉秀手展) at Kooalldam Gallery in Inchon. She is also participating and doing her art works in the Asian Students and Young Artists Art Festival (ASYAAF) at Dongdaemun Design Plaza in Seoul.